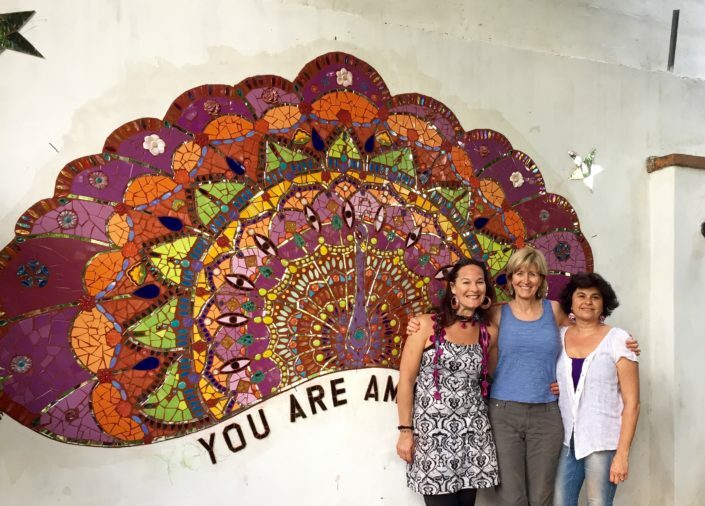 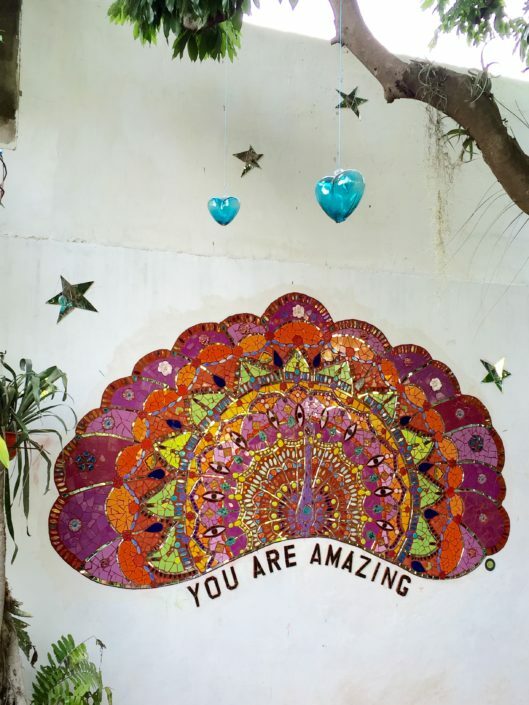 Mural design and facilitation by Laurel True. 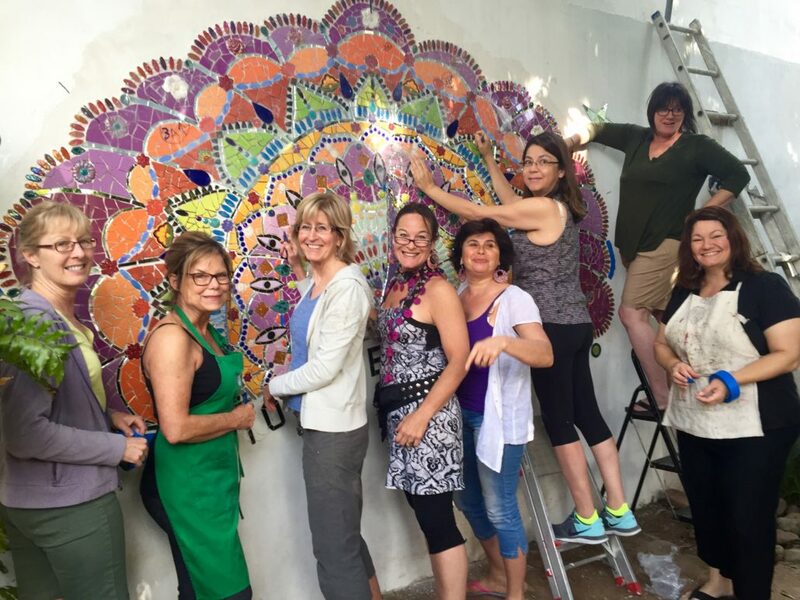 Marsha Rafter, Cynthia Aldridge, Milena Astorga, Jan Bear, Lisa Donahue, Julia LaBenz, Dominique Lucar, Amy McClure, Karen O’Brien, Gina Rother and guest artist Valerie Nicoladze. 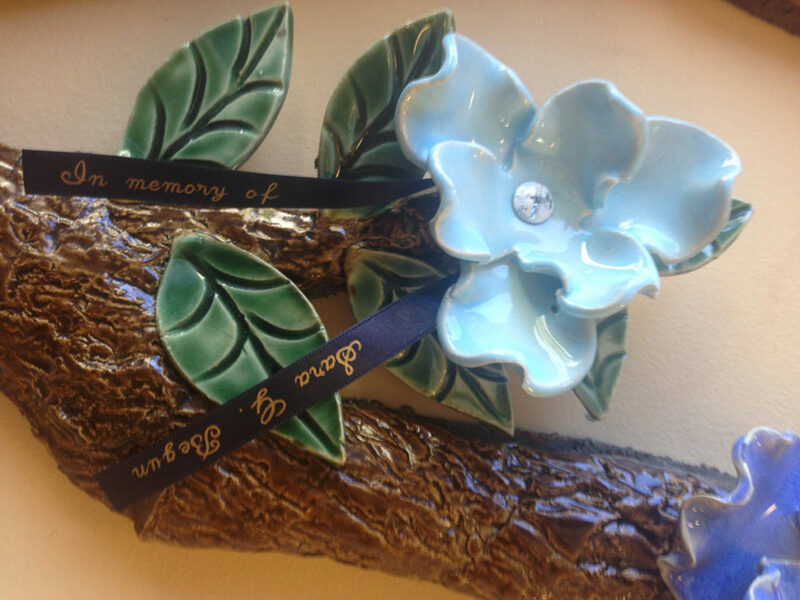 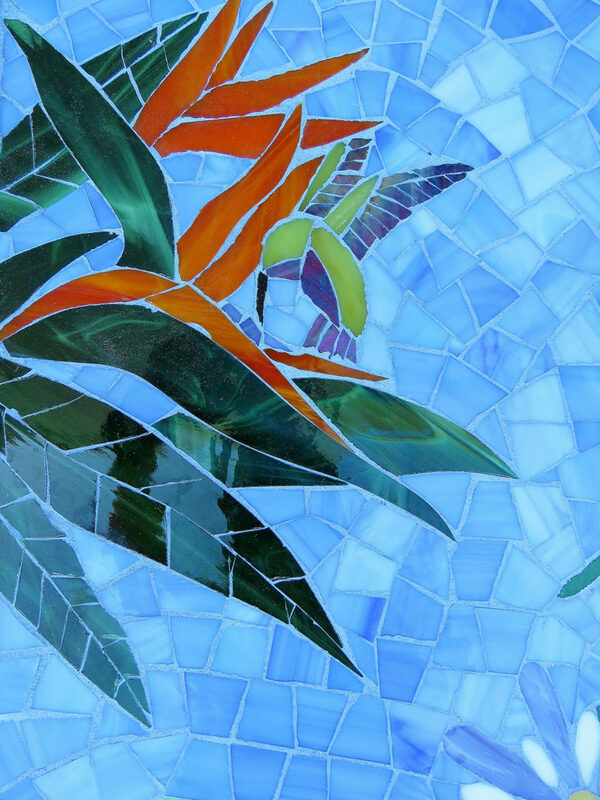 Ceramic tile, mirror, glass with handmade ceramic flowers by Jan Bear. 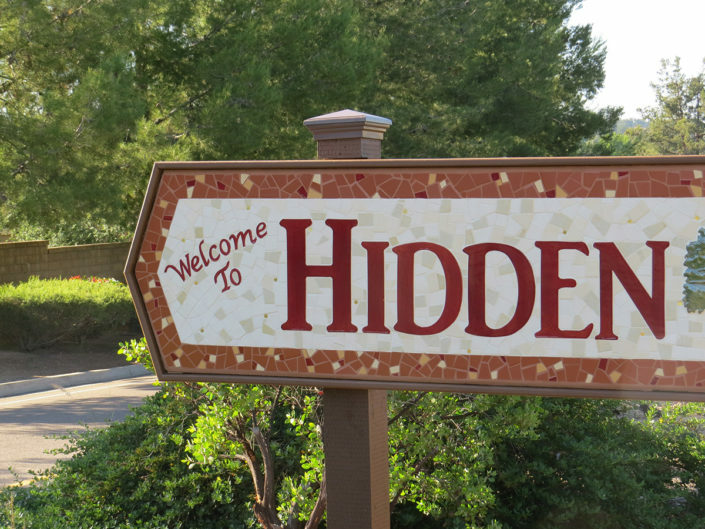 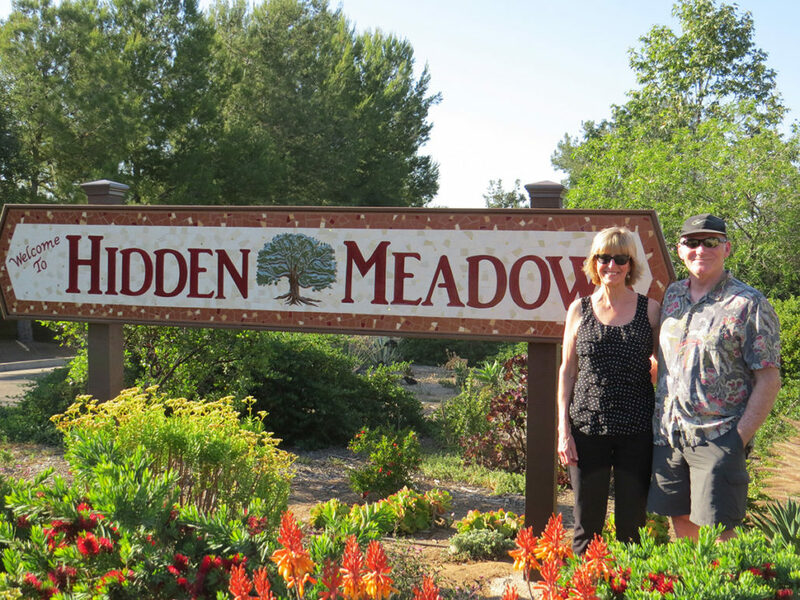 This 2’ x 12’ sign is at the entrance of the Hidden Meadows Community in north Escondido. 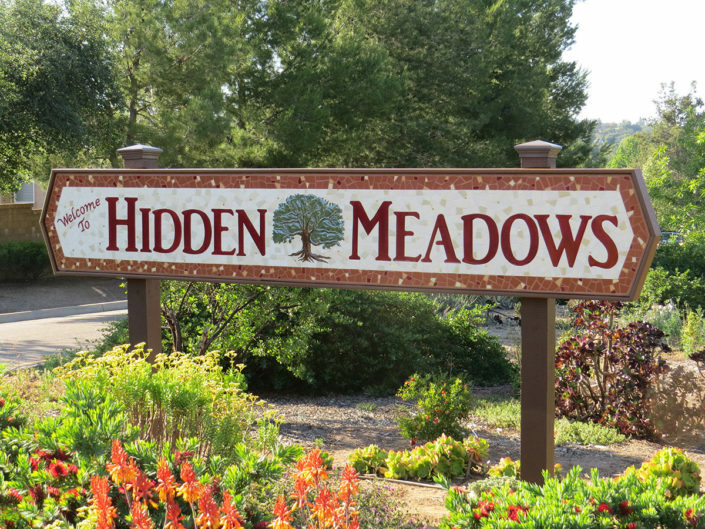 It was designed to blend in with the very rural area and the vegetation surrounding the sign. Native oaks abound in the community and so the sculpted oak tree was created as the focal point. 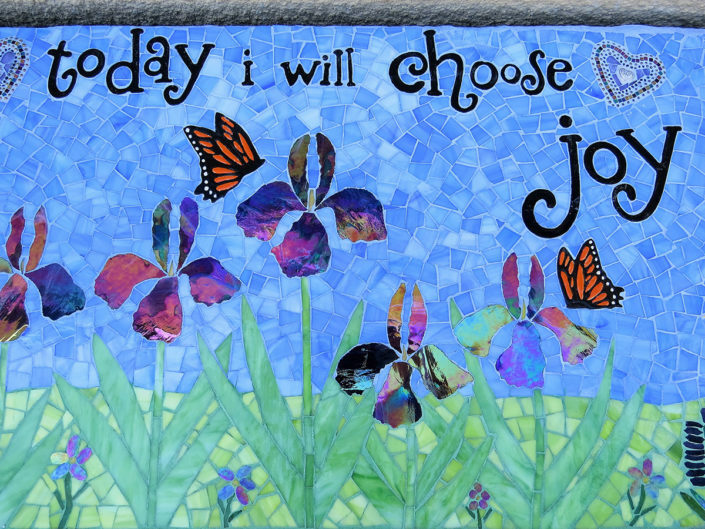 The letters are sculpted from clay and the surrounding tile is handmade, textured and glazed in four colors of white. 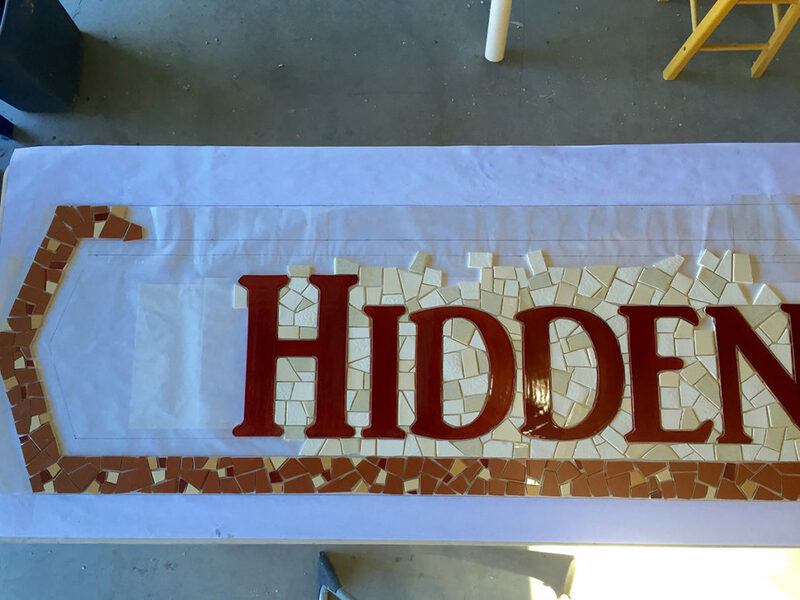 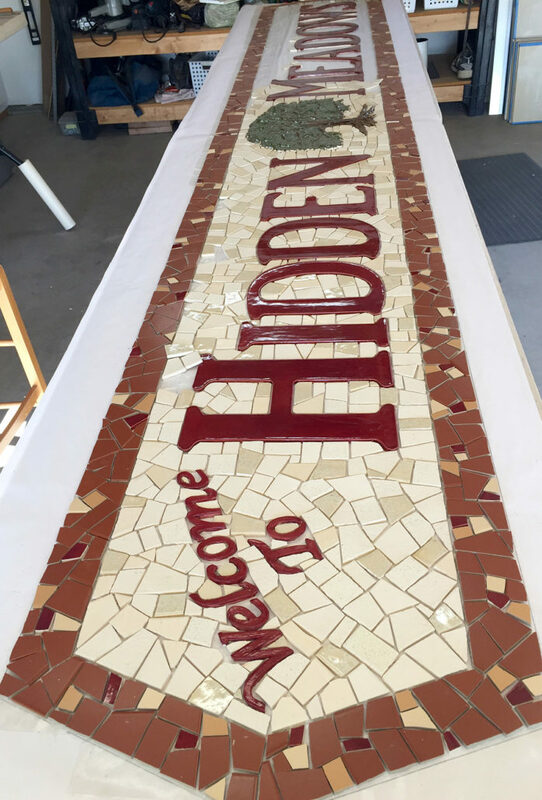 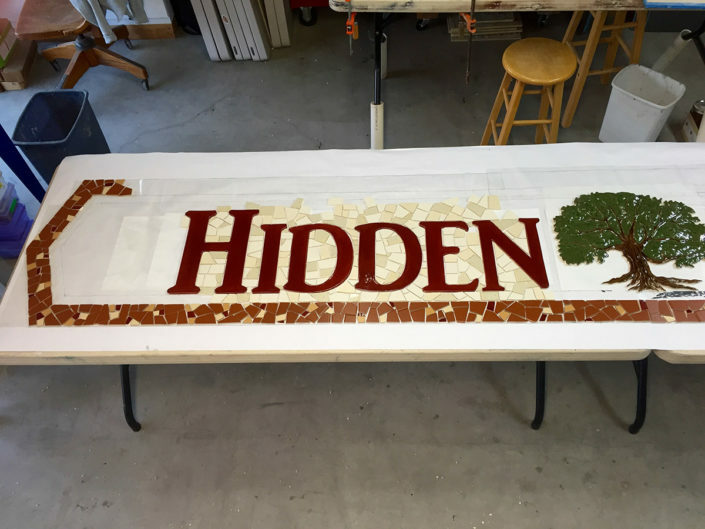 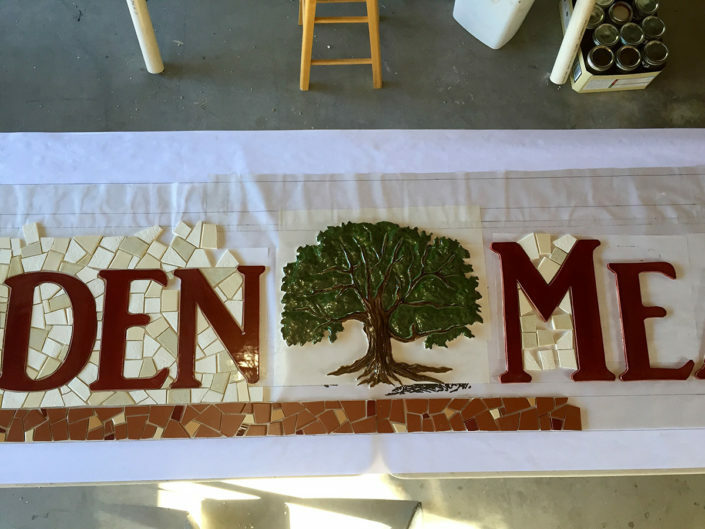 The back side of the sign has over one hundred donor tiles as all the money for the sign was generously donated by residents of the Hidden Meadows Community. 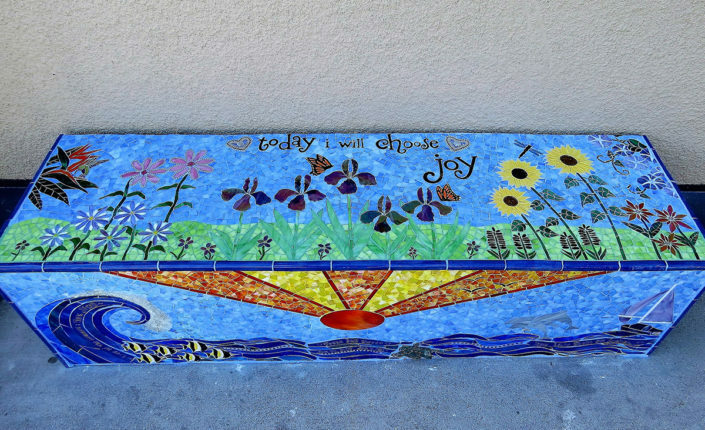 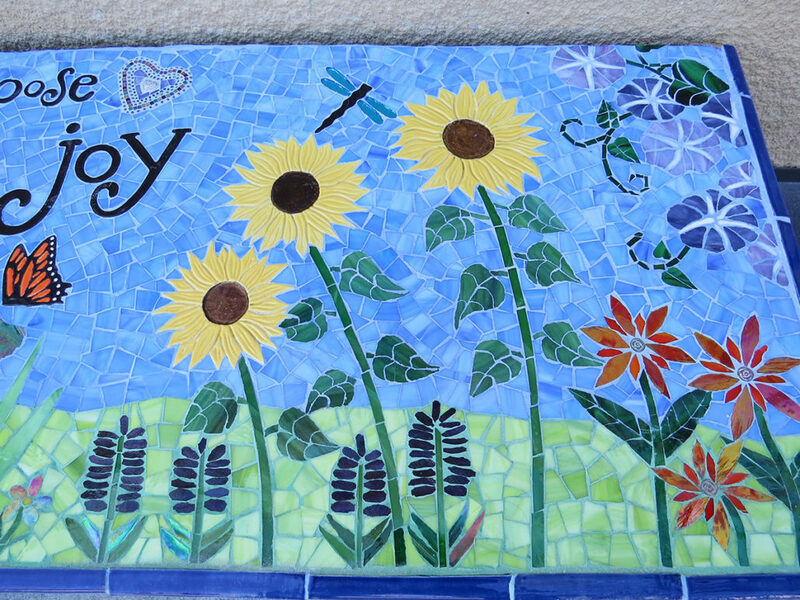 The family of Tessa Joy Davis lovingly collaborated with me to design this memorial bench to honor the life of Tessa, who passed away during her senior year of high school. 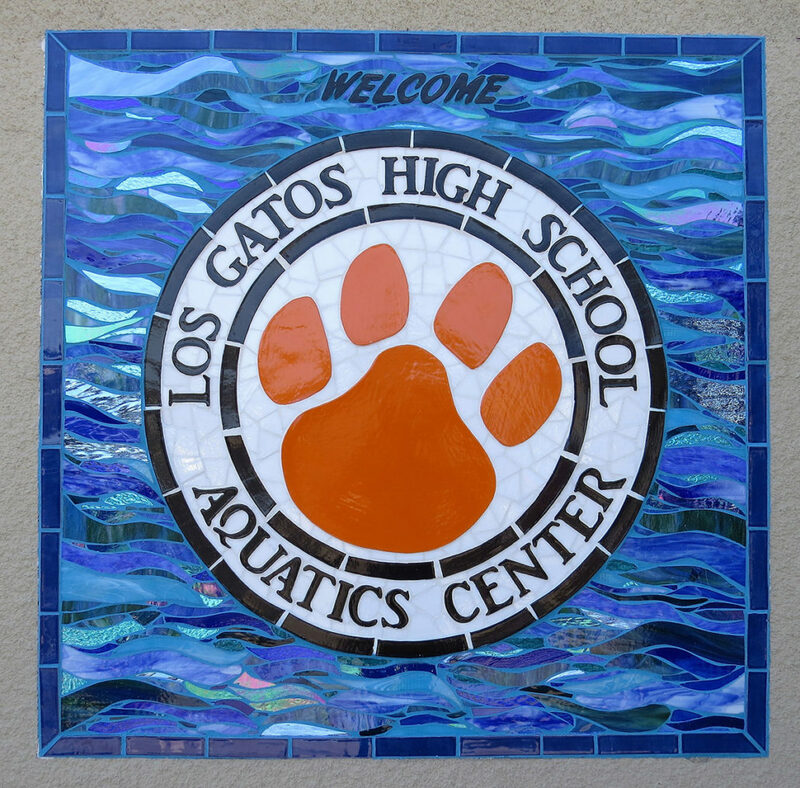 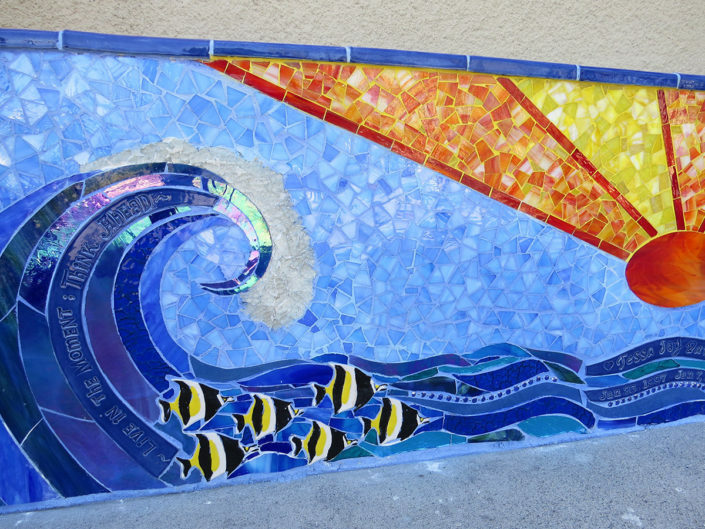 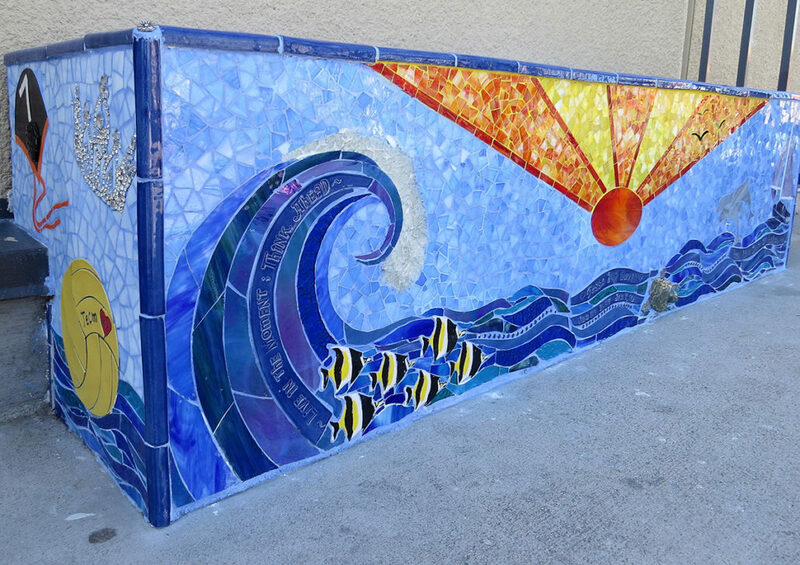 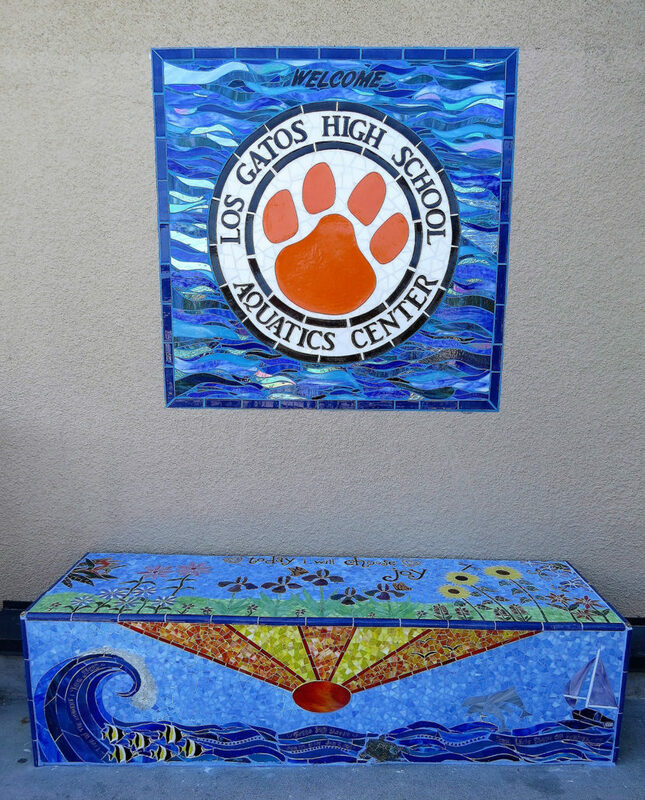 The bench is located at Los Gatos High School in Los Gatos, California outside the Aquatics Center where Tessa was a water polo player. 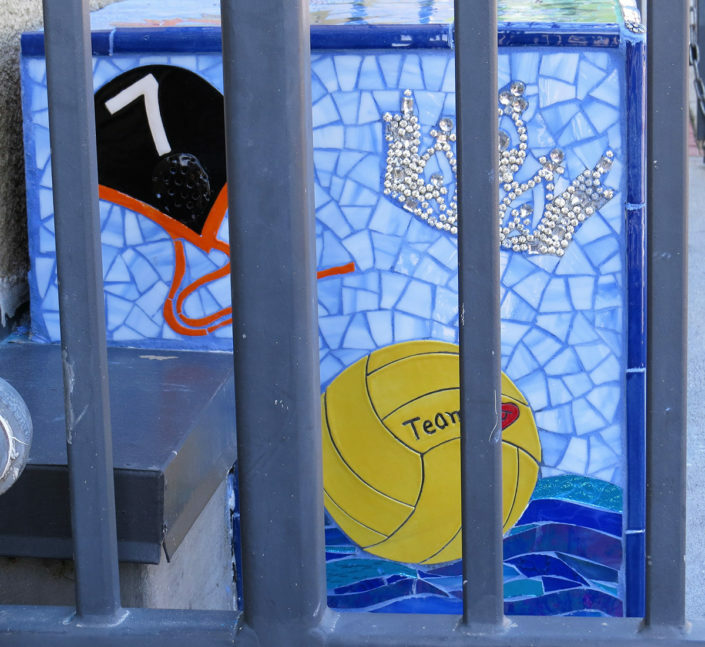 Elements in the bench design include Tessa’s water polo cap and ball, which are sculpted out of clay and her homecoming queen crown made of jewels. 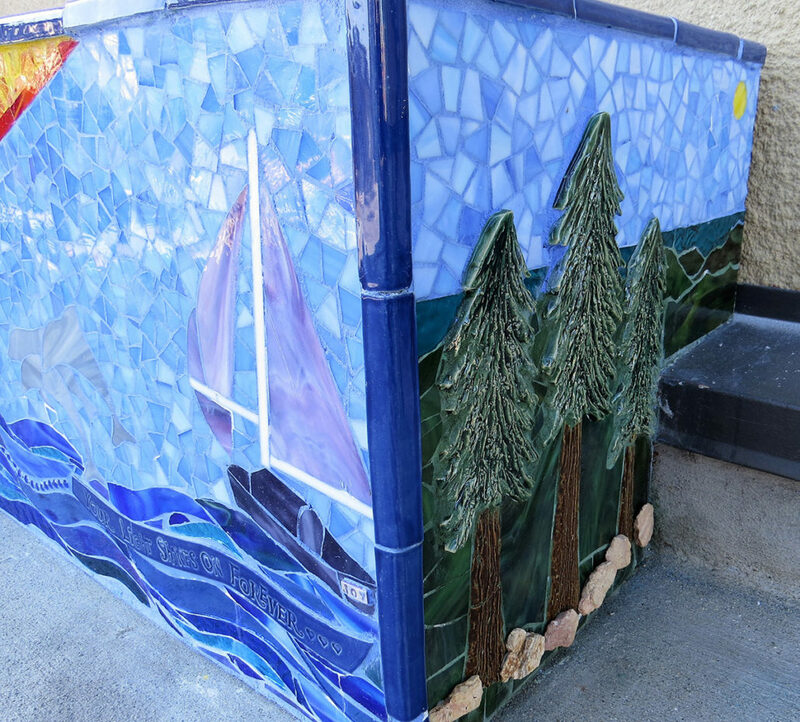 A view of the ocean from the redwoods in the Santa Cruz Mountains where their family lived is on the opposite end. 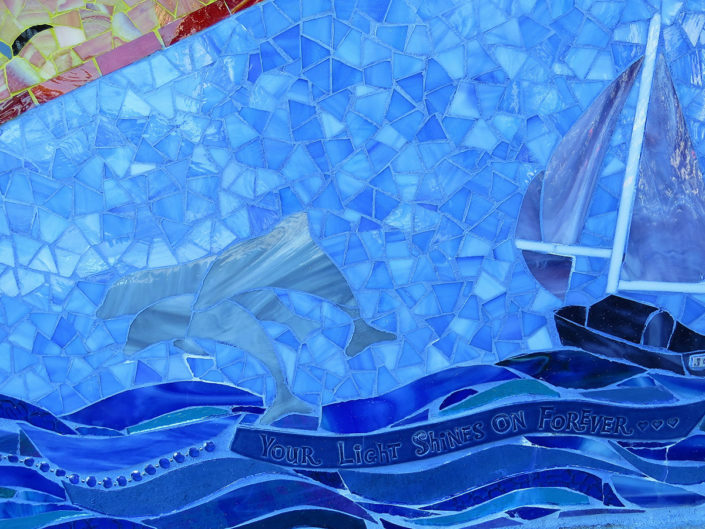 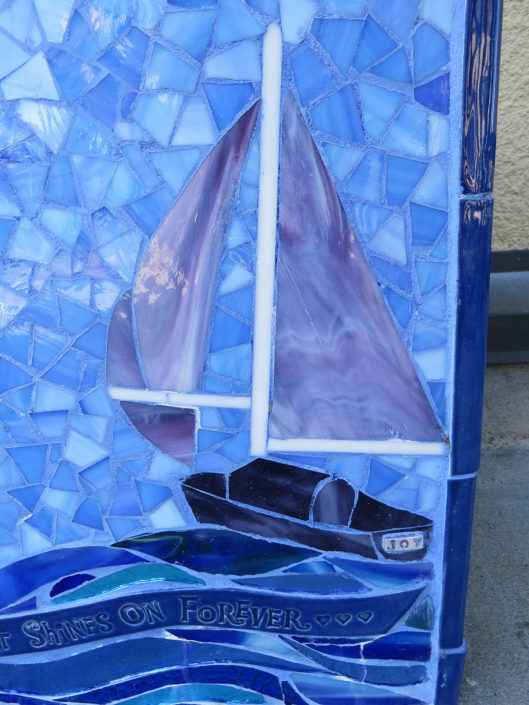 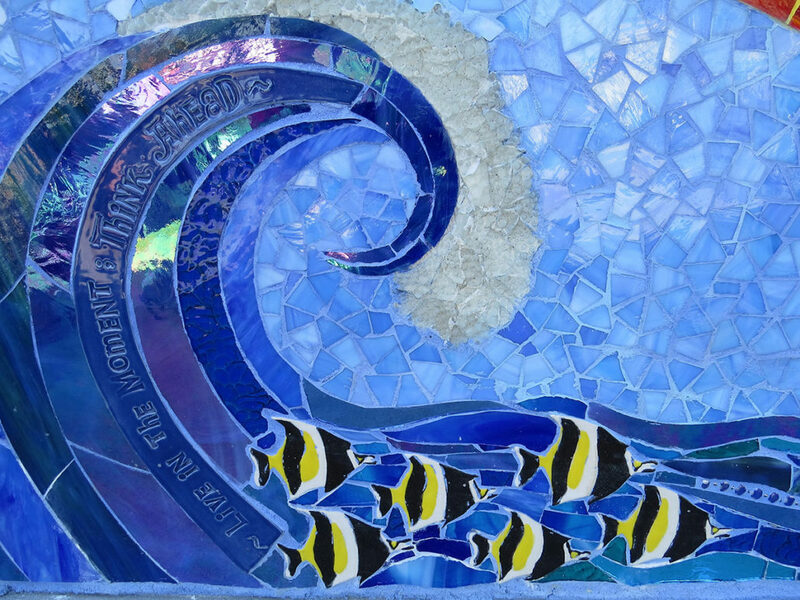 The front represents the family’s love of adventure and their many trips sailing in the tropics, as well as in the Pacific Ocean in Santa Cruz. 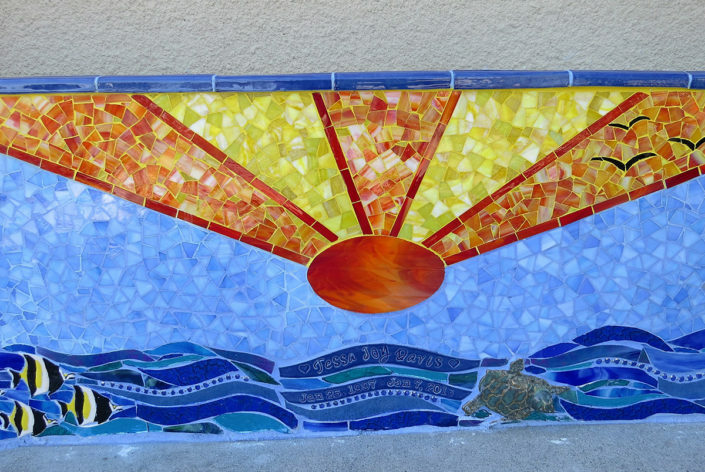 Tessa loved watching the sunset from their mountain home and always called out “Sunset alert!” The flower garden is representative of the vibrant, happy and beautiful young woman Tessa was, and her “Joyful” spirit. 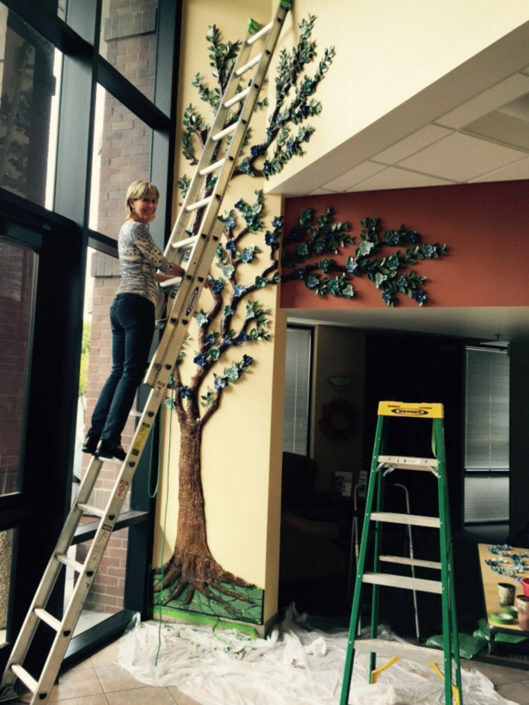 This fifteen foot tall tree was designed as a fundraising tool and is located in the foyer of Hospice of the Valley’s offices in San Jose, California. 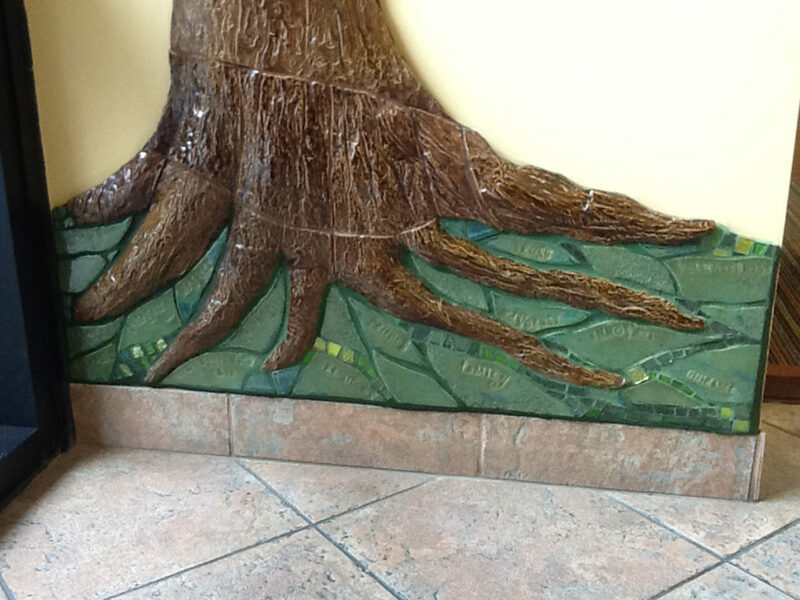 The trunk was sculpted out of clay and textured with tree bark. 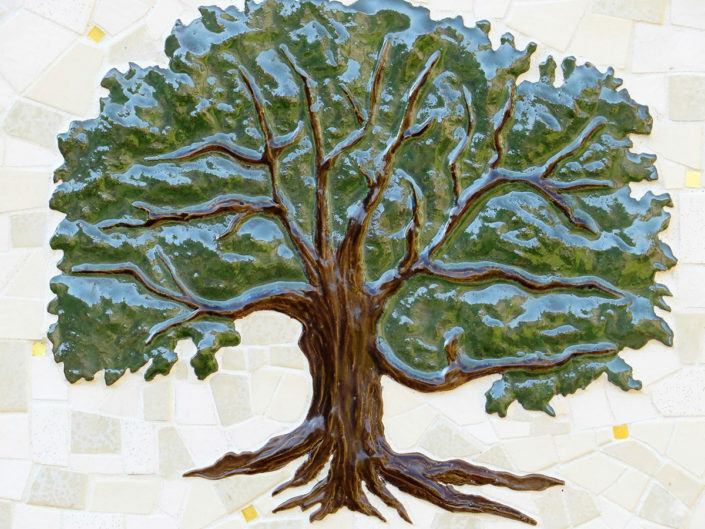 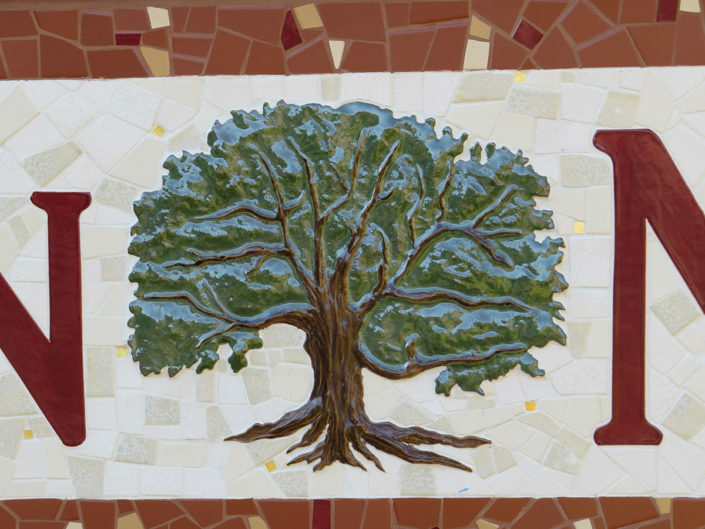 The base of the tree is mosaicked and has words pressed into the clay that represent the mission of Hospice. 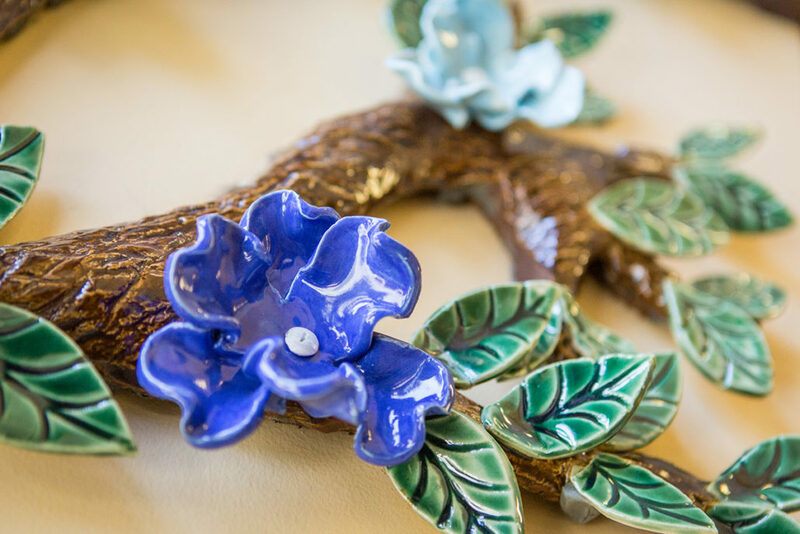 The leaves were all hand sculpted as well as the flowers. 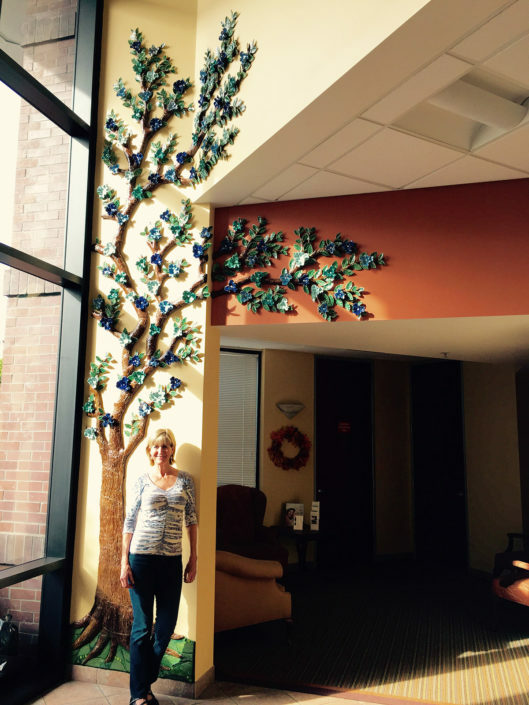 The flowers are put on the tree by donors in memory of loved ones and are attached to the tree with screws. 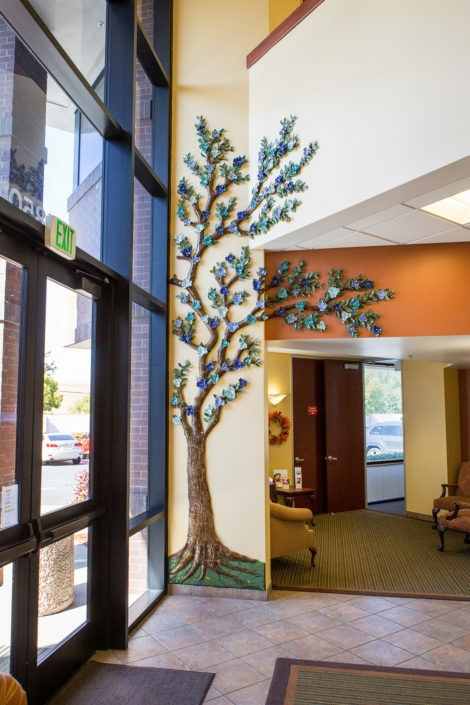 Thus they may be removed after the fundraising period and given to the donor families.